In an effort to protect the District's more than 22 miles of shoreline, Mehlville Fire Protection District launched a Special Operations Swift Water/Fast Rescue Boat Program in 2010. The 15 member team was selected from employees who passed a swim endurance test and held a minimum certification of Swift Water Rescue Technician. Once selected, team members were required to engage in initial training that was fast paced, challenging team members' endurance and testing their skills over a three day period. Initial training was conducted by District personnel who received specialized training from Marine Rescue Consultants, a company that does United States Coast Guard training. The "Train the Trainer" class consisted of boat operating skills as well as rescue scenarios in the Mississippi River. Boat Operators must master the use of the Districts' two inflatable rescue boats and specific skills including working near bridges, working in flooded areas, working in strong currents and bringing victims aboard the vessel. Due to the dynamic nature of water rescues, ongoing training is planned throughout the year. 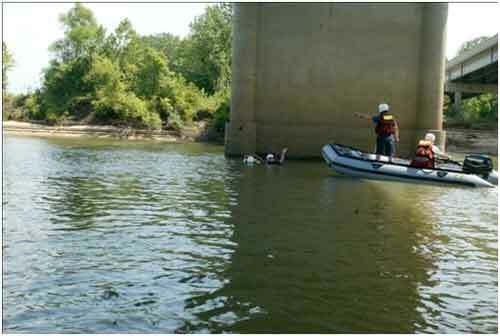 During a training exercise, a rope throw bag is used to rescue a victim caught near a bridge abutment.